Ancestry: Levi Phinney; Isaac Phinney; Thomas Phinney; John Phinney; John Phinney; John Phinney, Dea. Born: October 15, 1807 in Barnstable Ma. 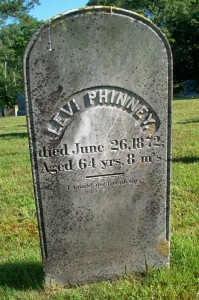 Died: June 26, 1872 in Sandwich Ma. at 64 yrs, 8 mos. Married: December 14, 1831 in Sandwich Ma. 1. 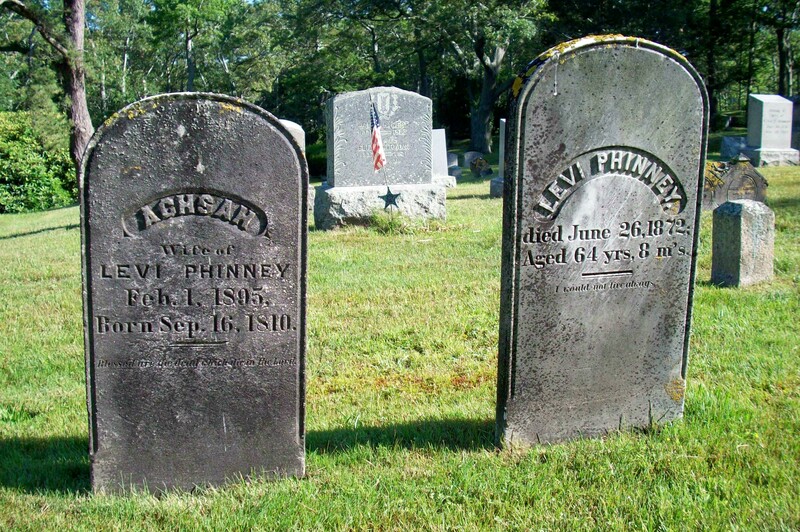 Lydia Ann Phinney; (October 21, 1832 – March 20, 1914); Died in Bourne Ma. at 81 yrs, 6 mos. ; Unmarried; She was living with her brother Levi L. in 1903;; Lydia is buried in Cataumet Cemetery. 2. Thankful Swift Phinney Edwards; (April 3, 1837 – April 15, 1907); Married Vinal N. Edwards (1840 – 1919) (Benjamin Jones Edwards & Eleanor Swift) in Sandwich Ma. 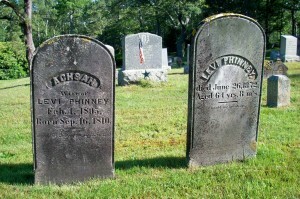 on December 25, 1862; They had 5 children; Thankful & Vinal are buried in Woods Hole Cemetery. 3. Reuben Crowell Phinney; (April 6, 1843 – November 3, 1883); Married Lucy Maria Barrows (1848 – 1929) (John Brooks Barrows & Rebecca P. Bumpus) in Wareham Ma. on April 11, 1869; They had 4 children; Reuben & Lucy are buried in Cataumet Cemetery. 4. 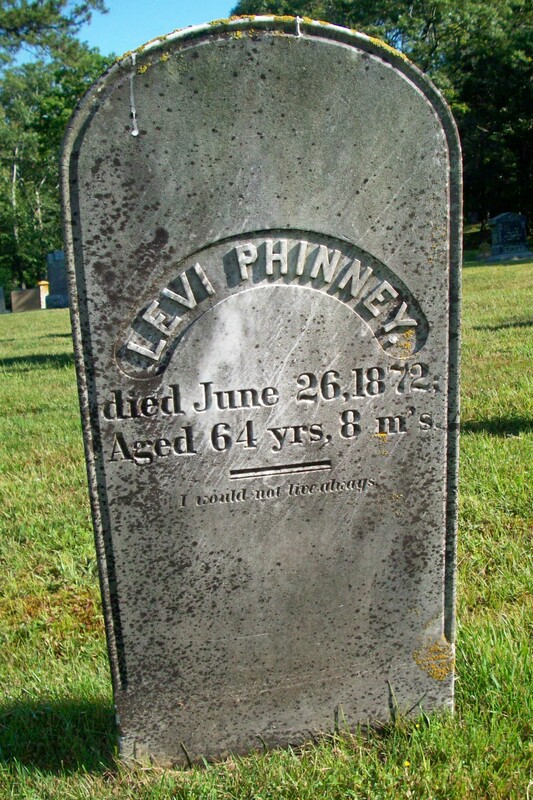 Levi Lincoln Phinney; (November 20, 1845 – November 26, 1918); Married (1) Harriet/Hattie L. Kendrick (1851 – 1886) (Daniel Herbert Kendrick & Harriet Dexter) in Sandwich Ma. on November 12, 1871; He married (2) Frances/Fanny Walcott Edwards (1848 – 1905) (Benjamin Jones Edwards & Eleanor Swift) on June 14, 1893; Levi L. married (3) Ethel L. Gartland (Abt.1866 – ?) (Peter/Peta Gartland & Sabra E. Wixon) in Bourne Ma. on June 23, 1909; Levi L., Hattie & Fanny are burried together in Cataumet Cemetery.